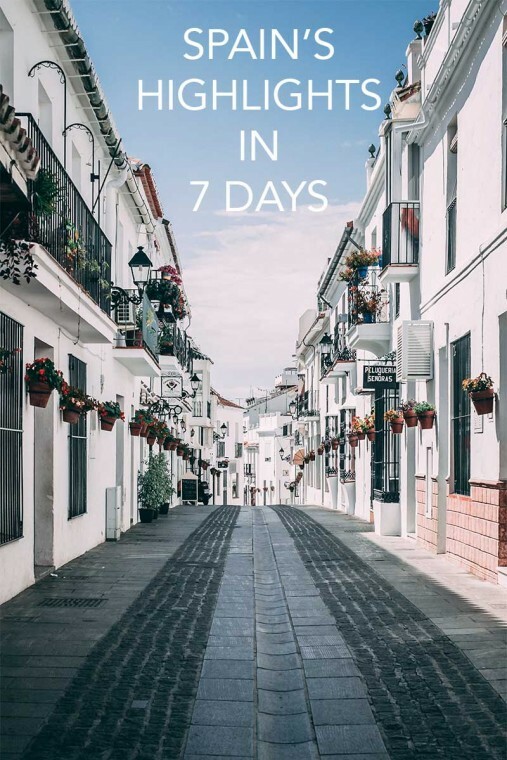 This 7 days in Spain itinerary is a guest post by Paroma. Spain, with its sun-kissed coast, vibrant cuisine and an even more colorful culture, simply stands apart from the rest of the Western European countries. The geography and polity change drastically as you go from the northern Basque country to the bronzed coast of Malaga and this is what makes Spain so fascinating. This 7 days in Spain itinerary provides some highlights and must visit attractions in three Spanish cities: Seville, Granada, and Madrid. Two days in each of these grand cities is never enough but it’s certainly better than nothing. These are the main highlights to give you a taste of Spain. Seville is one of the southern cities of Spain and the birthplace of the famous Spanish folk dance, Flamenco. Needless to say, the best way to start your Spanish adventure would be to book your tickets to a flamenco show at either Casa De La Memoria in the Jewish Santa Cruz quarters or the more famous Tablao El Arenal. 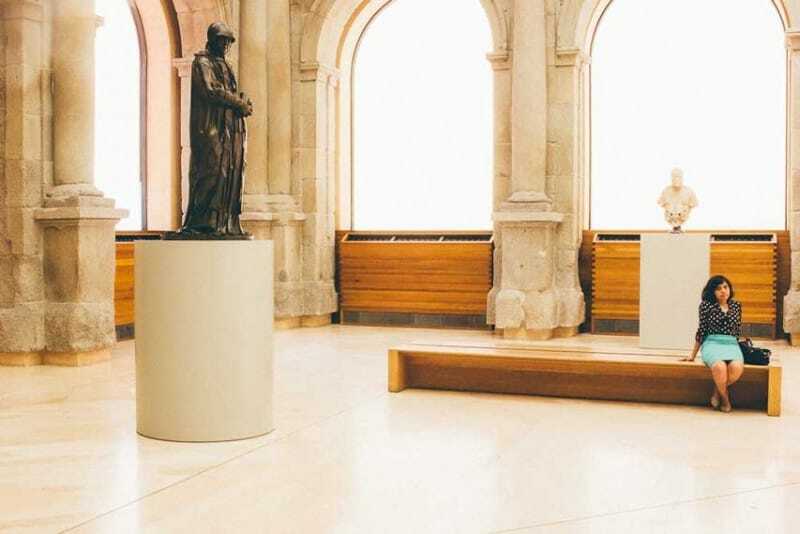 Art lovers can explore a treasure trove of paintings by Spanish masters ranging from the medieval ages to the early 20th century at the Museo De Bellas Artes where one can easily get lost admiring the famous works of art of Sevillian painters. If you’d rather explore the city than roam through museum galleries, the colorful old Jewish quarters of Santa Cruz are a great place to start. 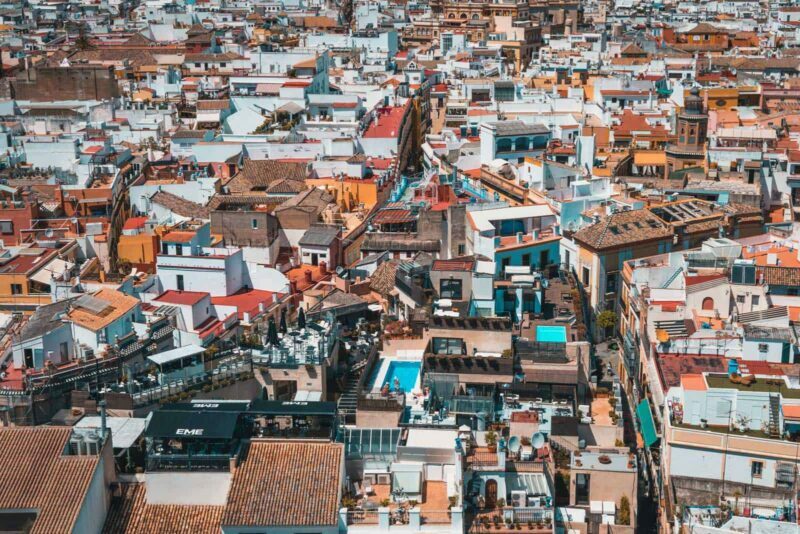 To get a bird’s eye view of the city, climb up the winding stairs of Gerald Tower (the last standing Moorish bell tower in Seville) for panoramic views of the city. Seville is a must during your week in Spain. Seville is also home to one of the grandest and most beautiful palaces in Spain and that is none other than Reales Alcázares de Sevilla or Royal Alcazars of Seville built by the Moorish/Muslim rulers. 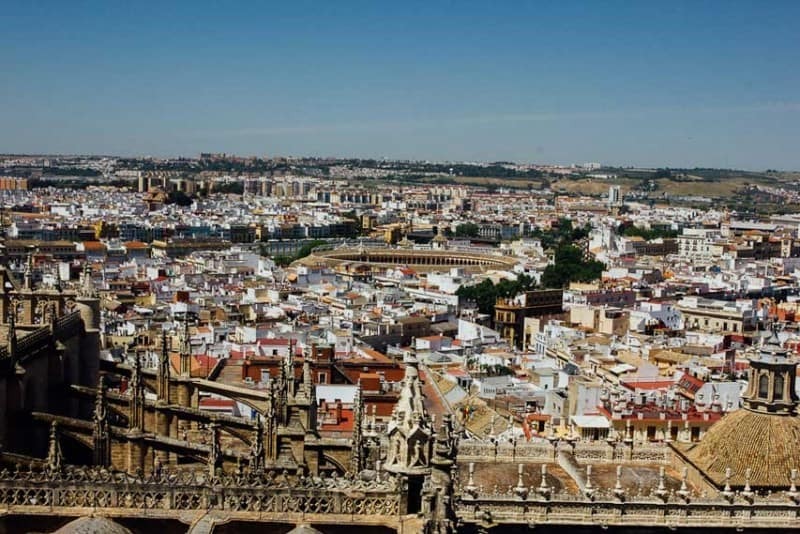 Being the number one attraction in Seville, it’s best to arrive early and buy tickets online in advance which guarantees entry through the express line with very few people. Plaza de Espana is another famous attraction of Seville which is essentially a plaza to see the Renaissance Revival style in Spanish architecture. There is a small canal there where you can indulge in some boating. If all this sightseeing tires you out, simply walk along the Guadalquivir River or visit Torre Del Oro, the famous 13th-century, dodecagonal military watchtower which offers fantastic views of the city and the river. The entry fee included a hike up the tower and entrance to a maritime museum midway. Seville is bursting with food options, out of which I highly recommend Bar El Paladar (for its vegetarian-friendly tapas) and Bodega de Santa Cruz, another wildly popular greasy tapas place. The food in Seville is to die for! if you have some extra time between Seville and Granada, consider visiting Mijas Pueblo. The TOC Hostel is one of the best hostels in town. The hostel itself is modern with good sized rooms, a cool design & most important, clean. A great choice for exploring Seville! Hotel Alcantara isn’t too difficult to find once you get your bearings in the narrow streets of Santa Cruz. The rooms are very clean and bright. Friendly staff and Flamenco dancing down the street, what more do you need? Hotel Alminar is a great value small hotel which is hidden away on a winding alley in the warren of the Santa Cruz Old Town, only yards away from the Cathedral and La Giralda. It’s simple but smart and contemporary. Granada bears the distinction of being the last Moorish bastion of Spain and is famous for the Alhambra (UNESCO declared world heritage site), the grand palace and fortress complex built by the Moorish Emirs. 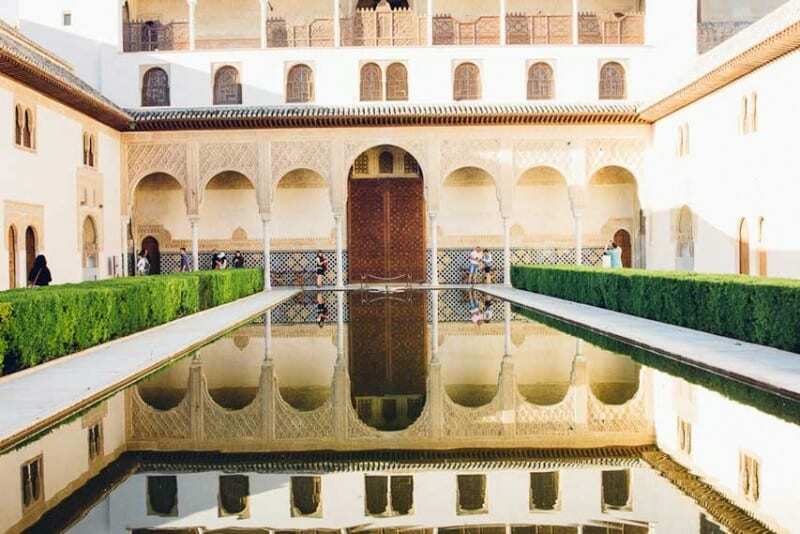 Your best bet would be to stay at the historic Albayzin district which is separated from Alhambra by the Darro River and is within 20-25 minutes walking distance to the palace. Tickets to the palace are sold out online for months in advance, so you can either queue up at the entrance gate super early in the morning to snag them or use this tip. Wander Alhambra while in Granada. The other major attractions of Granada are Monasterio de San Jerónimo and the Royal Chapel of Granada, the former hosting some splendid examples of Spanish Baroque in its sacristy. Exploring the Albayzin neighborhood’s narrow lanes and walking along the river’s sidewalk are also great ideas to get a feel for this beautiful city. I highly recommend it! Granada, like the rest of the Spain, has no shortage of unbelievable places to fill your tummy at. Food is life in Spain and you should participate in this celebration of excellent food any chance you get. Hotel Dauro Granada is a great choice for travelers interested in ancient landmarks, architecture, and monuments. This central hotel is clean, convenient and friendly. Ideal for exploring central Granada, with loads of nice bars and restaurants nearby. Hotel Anacapri has a prime location for visiting Granada, everything is within walking distance. The neighborhood has a small supermarket with a variety of restaurants with lots of options, Spanish, Indian, Italian, Syrian… The staff is extremely helpful. Melia Granada is located in the historical district, within a 10-minute walk of Plaza Mariana Pineda, Granada Cathedral, and Plaza Nueva. The breakfasts and cocktails are top notch. Madrid, the capital of Spain, is a sprawling metropolis where history effortlessly mingles with modernity. Kick start your Madrid exploration by walking down the bustling (and, very popular) street, Puerto Del Sol, where the city’s main square Plaza Mayor is located along with the famous statue of the Bear and the Strawberry Tree, present on Madrid’s coat of arms (statue is located between Calle de Alcalá and St. Jerónimo). Madrid is home to the Golden Triangle of Art, comprising of the Museo De Prado, Thyssen Museum, and Reina Sofia galleries. Reina Sofia hosts Pablo Picasso’s Guernica which art lovers should not miss at any cost. Photography aficionados can get a birds eye’s view of the city as well as a drink from the terrace of Círculo de Bellas Artes, located right at the mouth of the Gran Via. There is a small fee to go up to the terrace but is totally worth paying for the view. Make a visit to the Golden Triangle of art… For art’s sake! Finally, lovers of churros and thick drinking chocolate should not miss the famous Chocolatería San Gines where you can rest and enjoy a sip of delicious European drinking chocolate after a day of sightseeing. If you are a foodie or simply love trying new, local cuisines, do participate in a food tour in Madrid to learn more about the local culinary habits and get excellent insider only recommendations to restaurants unknown to tourists. Ok Hostel Madrid puts you in the heart of Madrid, within just a 10-minute stroll of popular attractions like El Rastro and Plaza Mayor. I would recommend this Hostel for all young people with a small budget. Europa Hotel is located in the center of the city (steps away from the Metro) making it conveniently near almost everything you could want to see in Madrid. A bit noisy at nights due to its centralized location, but worth it. Hotel Catalonia Plaza Mayor is a good quality hotel. The rooms are comfortable and reasonably spacious. There are a lot of cafes and bakeries nearby making breakfast easy so you can explore more. Yr of the Monkey is a place for all things travel, food, pets, and life hacks related. I am a scientist living in San Francisco with my husband and four-legged son. When not sulking in the lab, I can be found dreaming of new travel destinations to visit, new restaurants and photography gear to try out. Pin me if you LOVE Spain!